Before we have learned about AngularJS, Now it's time to learn Angular2. Why we will learn Angular 2? This question just comes in your mind, Right? Angular 2 is easier to learn than Angular 1.x. Here again, a question can come in your mind if you don't know angular 1.x and the question is, can we learn Angular 2 without having hands on experience in angular 1.x? Yes, we can very well skip Angular 1.x and start with Angular 2. But you might be thinking that is it really easier to learn? Yes, my friend Angular 2 is easier to learn than Angular 1.x. When I started before few month, I also though that it's very complex because of lots of configuration (.json) files. Believe me, it's really easy to learn and that is the purpose of this article to make the angular 2 learning easy for you with step by step process. There are many more features in Angular 2 over Angular 1.x like Performance improvements, Mobile Support and more will we learn later part of this article. Technically, Node.js and NPM are not needed to do Angular2 work. Here we will use Node.js as a package manager. It gives us the tool npm that allows us to download libraries and packages we will use in Angular 2. That's it what we need to know about it, for now. Later we will learn more about Node.js in the next steps. Setup Angular 2 development environment. First, we will download and install Node.js from https://nodejs.org/en/download/ if you have already not installed. 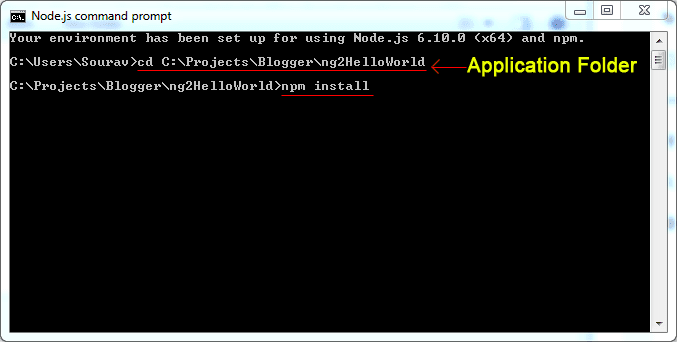 Open your Node.js command prompt then write command > npm install –g typescript and then click enter. Download/clone Angular 2 quick start configuration files from here https://github.com/dotnetawesome/AngularJS2Seed before start angular 2 coding. Here I have created an angular template for quick start with the minimal configuration files those are required at that moment, you can also download from here https://github.com/angular/quickstart which is provided by angular.io official site but there are lots of files those are not required at this moment as we are going to begin and I would like to make it as simple as possible for better understanding. These all the files you can see here what we have downloaded from the https://github.com/dotnetawesome/AngularJS2Seed is only for setup development environment So we can quick start angular 2 development. And most important things, this is just for 1-time setup and we don't need to know much about this configuration files right now as most of the time it will be identical and this files will not go to production. package.json: files contain all the dependencies/node packages meta-data that our application will depend on and defines some useful scripts. People always confused with this 2 types of packages. typings.json: In the typescript compiling process d.ts (typescript definition file) file used for getting typescript type information. When the compiler doesn't recognize something, it throws an error. we need do nothing to get typings files for library packages that include d.ts files. Angular packages include them already. But many libraries—jQuery, Jasmine, and Lodash among them—do not include d.ts files in their npm packages. So, we have to write typings.json file to get the correct type definition files to run the project smoothly. systemjs.config.js: This is contain systemjs configuration options. Now the question is what is SystemJS? We know that angular 2 application is a component based module and we will write each angular 2 component in separate files for making it well-structured & manageable. Again I am saying don't fell that it's too complex because of these configuration files. These are only used in the development environment and we can use these files on our every angular 2 application with some minimum changes if required. Now let's start creating "Hello World" application in Angular 2. Before start writing code we will install all the dependencies defined in the package.json file. Open "Node.js command prompt" > write command for change directory to your application folder > and then write command > npm install for install all the dependencies defined in the package.json file. When we will run this command, what it does actually its looks for package.json file and will download all the dependencies added here in the package.json file into the "node_modules" folder in our application root path. It will take a little time. You must have to connect with the internet otherwise it will fail. Angular 2 applications are made up of components. A component is the combination of an HTML template and a component class that controls a portion of the screen. Here first I will create a folder "App" inside this src folder first. 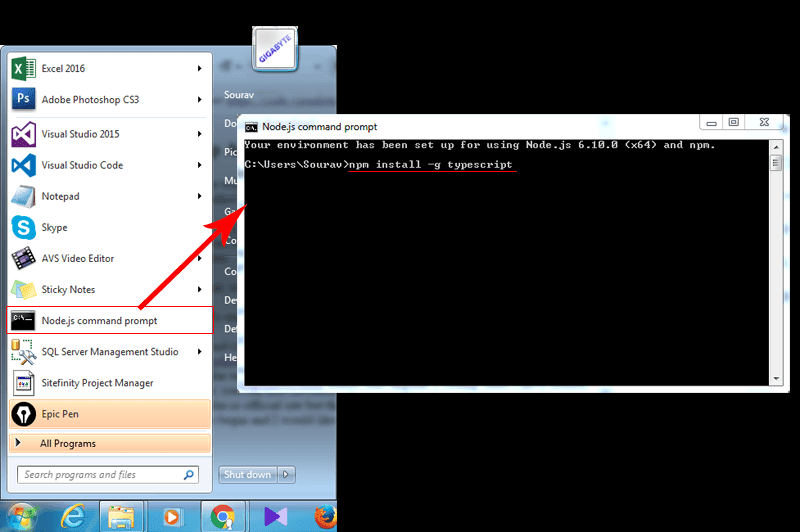 Right-click on the src folder > Create folder > name it "App". Now I will create 1 ts file "app.component.ts" file inside this app folder which is our first angular 2 component. Right-click on the App folder > add file > name it "app.component.ts"
Here I have created a class AppComponent with a @Component decorator for making it angular 2 component. you can see here I have added a selector "app", that's mean we can load the template with the title "Hello World" using this HTML tag now. The export specifies that the component will be available outside the file. We have created our first angular 2 component, Now we will create an angular 2 module. Angular apps are modular and Angular has its own modularity system called Angular modules or NgModules. Every Angular app should have at least one module class, the root module. We bootstrap that module to launch the application. Angular 2 NgModules contains imports, declarations, and bootstrap. imports - other modules whose exported classes are needed by component templates declared in this module. declarations - the view classes that belong to this module. Angular has three kinds of view classes: components, directives, and pipes. bootstrap - the main application view, called the root component, that hosts all other app views. Only the root module should set this bootstrap property. Now we will create 1 more file inside this "App" folder which is main.ts where we will write code for bootstrap our created angular module. You can see in the line 1-10, Here I have done system import with 'app' which is defined in the systemjs.config.js map section. This will load "main.js" file from App folder. "main.js" file will be generated when we will run npm start command, where we have bootstrapped our angular 2 module. and write command npm start.